As Grand Master of the largest karate federation on Okinawa I welcome each of you to the study of this time honored sport. My teaching techniques are based on Traditional Okinawan Martial Arts learning methods. Learning Karate and Kobudo is a step by step process, it takes time and practice. The history of our style is very important to your understanding of Kata (forms) and Kobudo (weapons). Please as a Martial Artist or potential student take the time to Study the Okinawan History; you will find it very interesting. Once again, welcome to our Karate “family” and Welcome to our Home Page! My only wish is for you to develop good heart, good family and good karate. The next successor in the lineage of Matsumura Shorin Ryu was Hohan Soken (1889-1982). He began training at age thirteen under his uncle, Nabe Matsumura. Soken had to work in the fields as a youth in spite of his Samurai heritage. This was due to a political reorganization in the Ryukyu Islands and all of Japan as a result of the Meiji restoration. 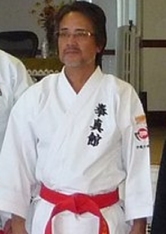 After ten years of basic training under Nabe Matsumura, Soken began learning the techniques of the white crane or Hakutsuru. This was in 1912 when he was twenty-three years old. According to Soken, this was a secret technique or training methodology which was confined to the Matsumura family. 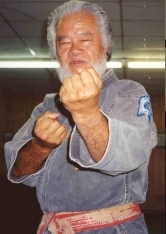 Bushi Matsumura had learned the white crane system in China. Soken’s instruction in the white crane technique emphasized balance training. 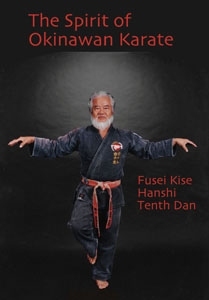 The Spirit of Okinawan Karate Extended Throughout the World by Hanshi Fusei Kise, published by the All Okinawa Shorin-Ryu Karate and Kobudo Federation. This is the autobiography of one of Okinawa’s greatest living karate masters. Devoted student of the legendary Hohan Soken, Grandmaster Kise has spent his life teaching traditional Matsumura Shorin-Ryu karate throughout the world. Great historical photos, plus a section illustrating the kata that Grandmaster Kise developed under the guidance of Master Soken. This is a 192-page hard cover book with dust jacket, limited to 2000 numbered copies. First published in Okinawa in 2000, the English language edition was published in 2003. Each copy is personally signed by Grandmaster Kise.